Award-winning photographer Ian Collins made only one mistake in life, but it cost his mother her freedom and destroyed their family, leaving Ian to practically raise himself. For years he’s been estranged from his father, and his mother has lived off the grid. For just as long, he has searched for her. Now, Ian seemingly has it all—national recognition for his photographs; his loving wife, Aimee; and their adoring daughter, Caty. Only two things elude him: a feature in National Geographic and finding his mother. When the prized magazine offers him his dream project on the same day that Aimee’s ex-fiancé, James, returns bearing a message for Ian but putting a strain on his marriage, Ian must make a choice: chase after a coveted assignment or reconnect with a mysterious woman who might hold the key to putting his past to rest. But the stakes are high, because Ian could lose the one thing he holds most dear: his family. 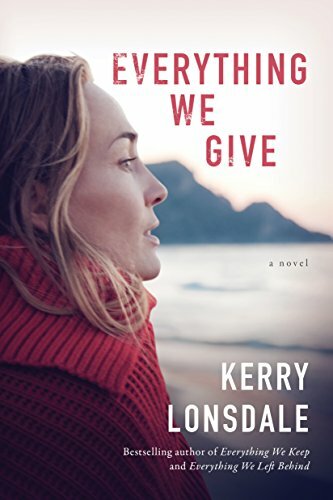 Kerry Lonsdale is the Wall Street Journal, Amazon Charts, and #1 Amazon Kindle Bestselling author of the Everything series—Everything We Keep, Everything We Left Behind, and Everything We Give—as well as All the Breaking Waves. She resides in Northern California with her husband and two children. Learn more about Kerry at www.kerrylonsdale.com. Everything We Give is the final book in the Everything trilogy; it’s bittersweet to have the series end…I feel like these characters are friends…people I truly care about.. people with whom I’ve shared their joys, their triumphs, their tragedies, their sadness, and, mostly, their love. This book is a fast-paced romantic suspense story, filled with emotional highs and lows, and the twists and turns of the mystery of Ian’s traumatic childhood. Ian is a loving husband and father, but can’t move forward until he can confront and come to a resolution with his past. We’ve really watched the character of Aimee grow in this series, from being a naive young lady whose world is torn apart, to a woman who has become confident and secure. There were some surprises in this book as we follow along with Ian on his journey to restore his love and his life, and the scenes told in flashbacks are harrowing and painful. This book kept me up until the wee hours of the night, a minor sacrifice with such a fantastic story! If you have not read the first two books in this series, stop everything and read them before you dive into this one…you will thank me later! I loved the first two books in this trilogy and have been waiting patiently (not too patiently) for the final book. WOW – what a fantastic book. To get the absolute most enjoyment out of this book, you really need to read all three books in order. Everything we Keep was mainly Aimee’s story, Everything we Left Behind was James’ story and Everything we Give is Ian’s story – and what a story it is! Even though Ian is a successful photographer with a wife that he loves and a daughter he adores, he is haunted by his younger years and a mistake that he he made that drove his mother away and destroyed his family. With James back in the picture and a major photography trip for National Geographic, Ian has to decide whether to ignore his past or try to fix his past mistakes at the chance of ruining his future. Everything we Give totally wraps up all of the issues from the first two books plus gives us a close-up view of Ian’s life. This was a fantastic book and the perfect ending to the trilogy. I read an advance copy of this book. All opinions are my own. Loved the book – and the series…. Hate to see silly mistakes. When Ian has dinner with Reese he glances at his ‘tarnished gold ring’ Gold does not tarnish.